Some people go to Melaka just for the food. 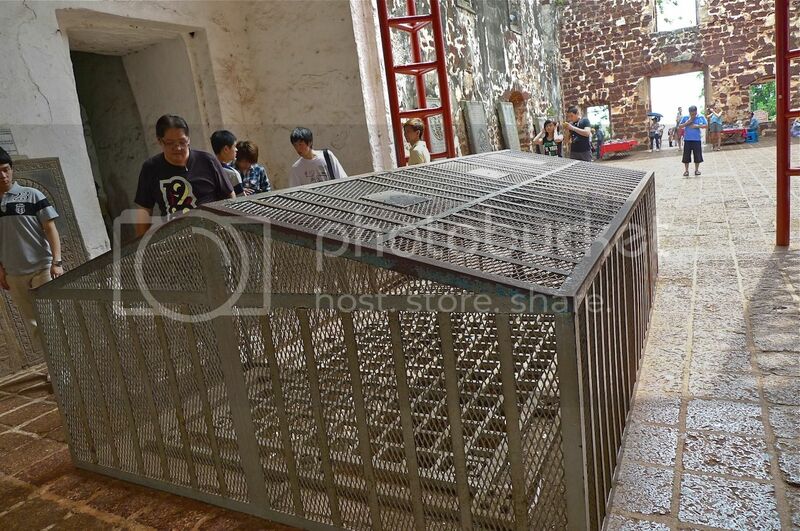 Others go there to visit the historical sites. 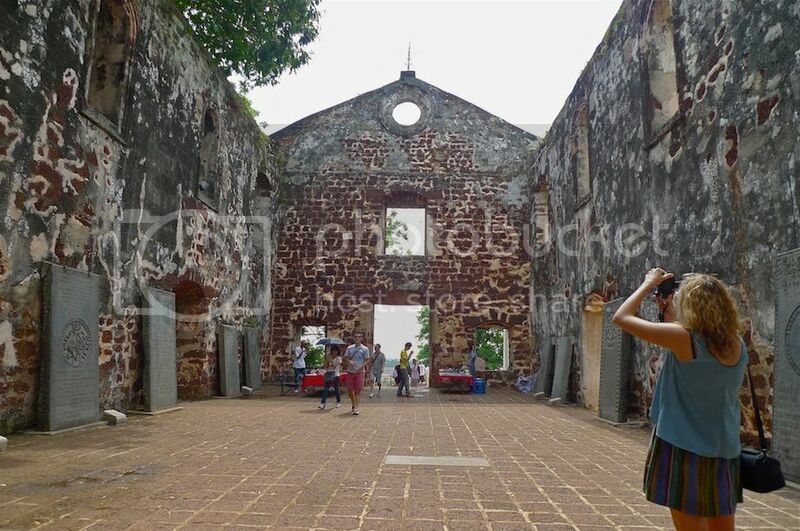 If you are a first timer to Melaka, then you must visit the historical sites as Melaka is now listed as a UNESCO World Heritage City. 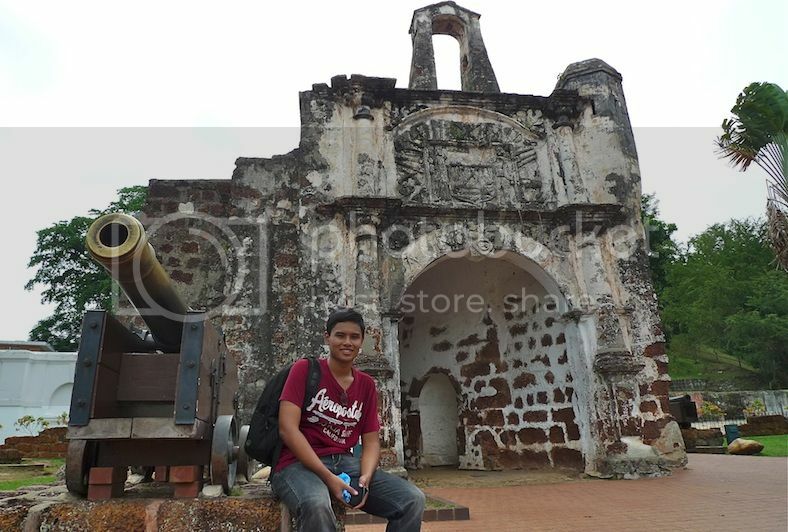 Last April, I brought my Filipino friend Joey to Melaka. As he had never visited Melaka before, I decided to be his tour guide even though I was not that familiar with this city. Besides the historical sites, I also brought him to savor some of Melaka's famous food. I think he did not really like the satay celup, but that's a story for another day. 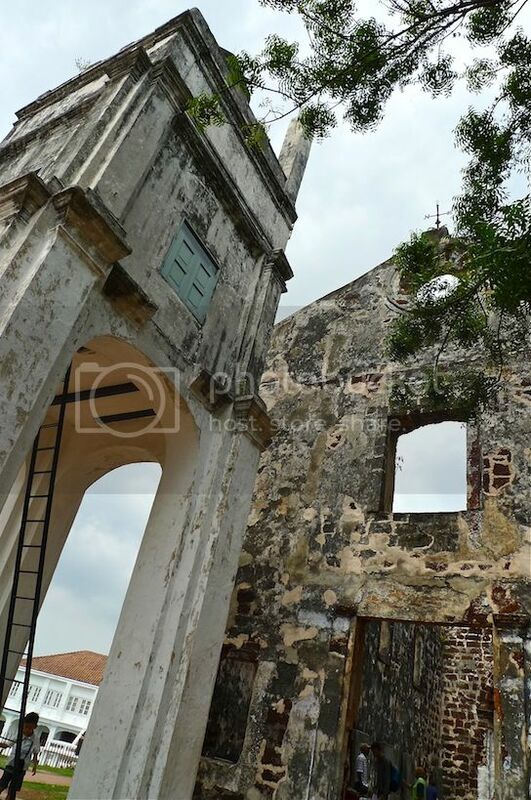 After our visits to Melaka Clock Tower, Christ Church Melaka and The Stadthuys, we climbed the St. Paul's Hill to visit the famous St. Paul's Church located at the summit. A statue of St. Francis Xavier greeted us. Francis Xavier was a Roman Catholic missionary from Spain during the Portuguese rule. 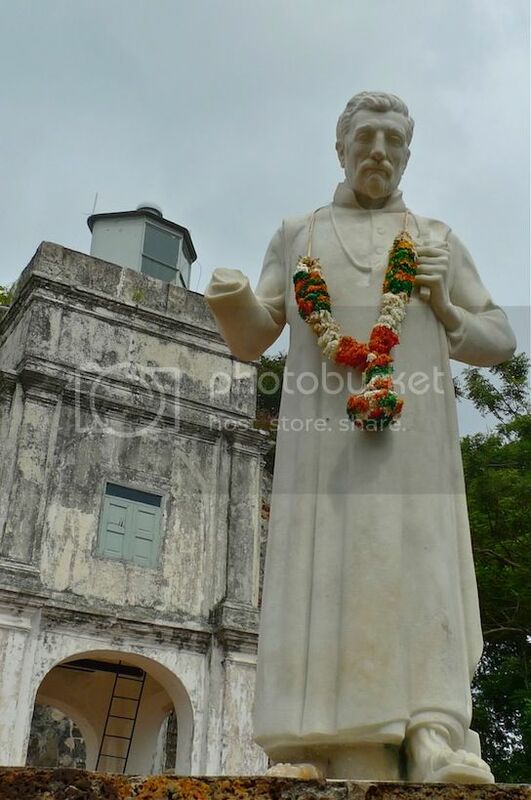 This statue was erected in 1952 in commemoration of the 400th anniversary of St. Francis Xavier's sojourn in Melaka. Did you notice that broken right arm? Well, something strange happened a day after the statue was consecrated. A large Casuarina tree fell on the statue breaking off its right arm! Interestingly, the right forearm of Xavier was actually detached back in 1614 as a relic! Coincidence? Behind the statue is the ruins of St. Paul's Church. Built in 1521 by a Portuguese nobleman, the original structure was a simple chapel but was later further enlarged with the addition of a second floor and a belfry tower. 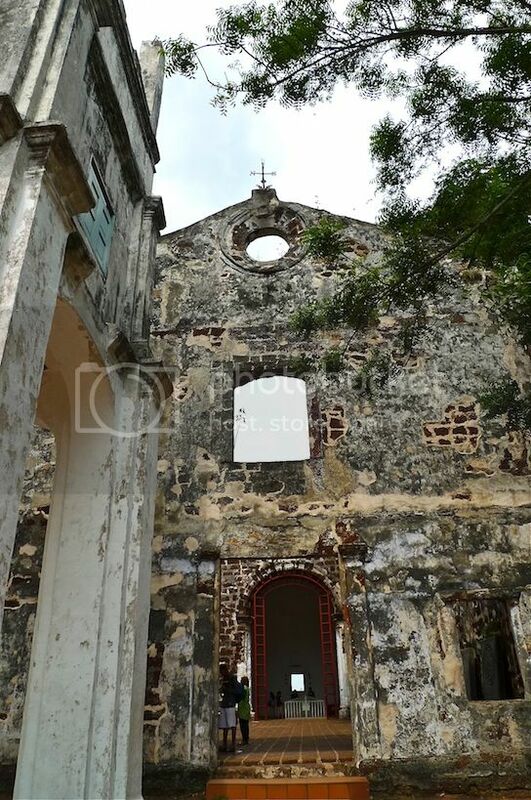 This is how the interior of the church ruins look like. See those rectangular objects leaning on both sides of the wall? They are actually tombstones! There's a burial vault in this church and many people of distinction were actually buried here. However, there were also many graves scattered around the vicinity of this church. 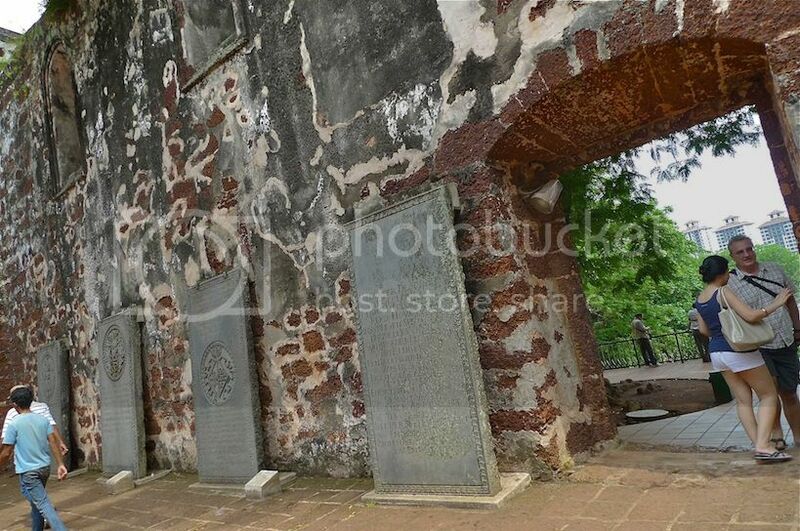 During an excavation done in 1930 by the Malacca Historical Society, the tombstones that were uncovered were then affixed to the walls. Then I saw some people peering into a strange looking structure at the back of the church ruins. I was wondering what they were looking at! I remember Joey asking me what that structure was and I really could not give him an answer. What a lousy tour guide I must be! Haha! I did not see any information there that could help me out so that I could at least give an intelligent reply to Joey. 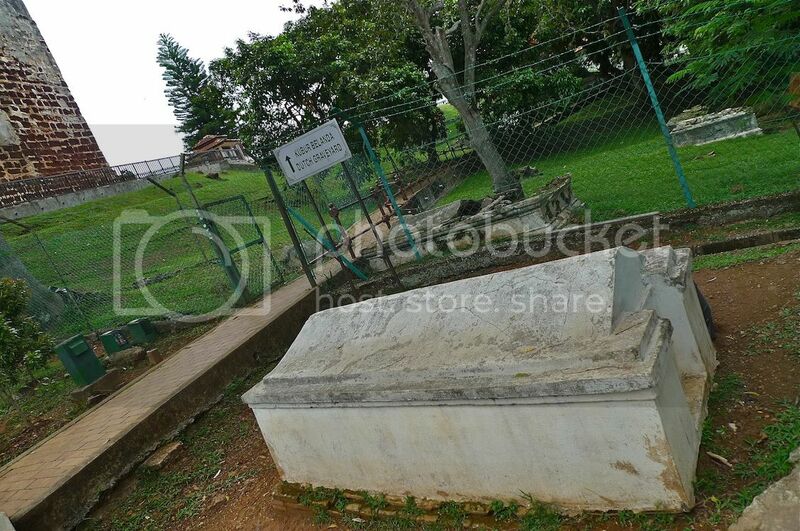 Later however, I learnt that it is actually an open grave where St. Francis Xavier was once buried! Xavier had used the church as his base for his missionary journeys to China and Japan. In one of those journeys, he fell sick and died in Shangchuan Island, China. 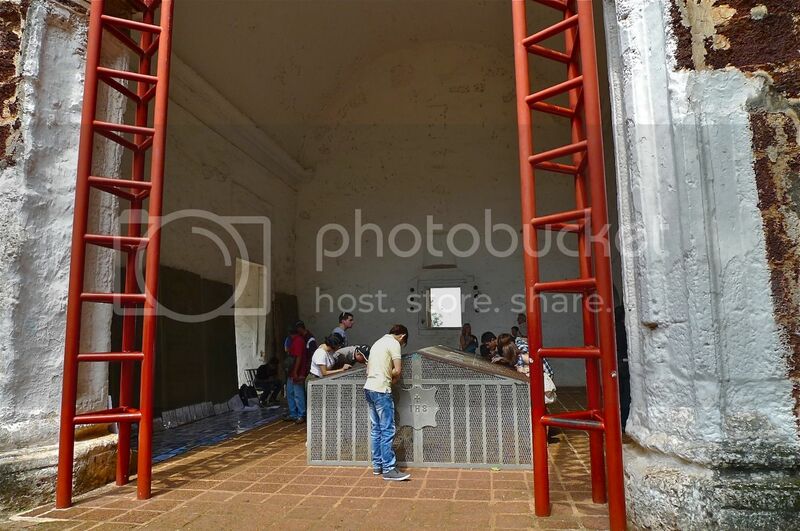 His body was brought back and buried temporarily in this church before it was finally shipped to Goa in India. 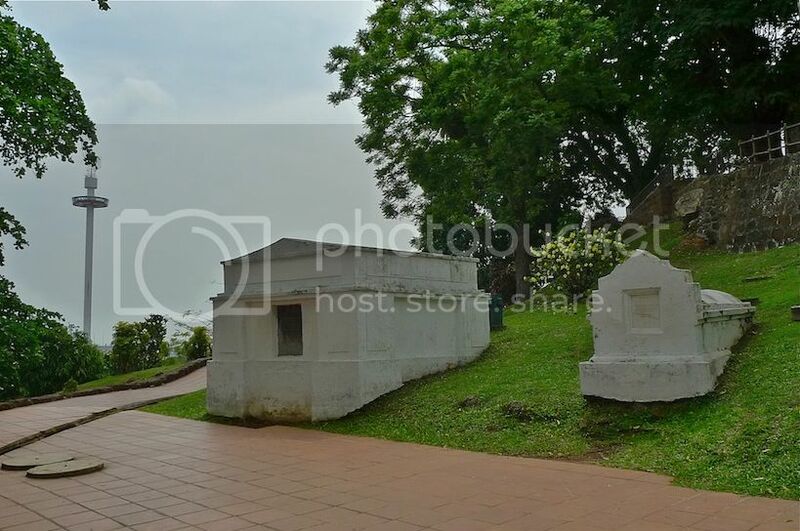 As we left St. Paul's Church and walked down the hill towards the A Famosa ruins, we passed by the Dutch Graveyard. Can you see Melaka's famous revolving tower, Menara Taming Sari in the distance? 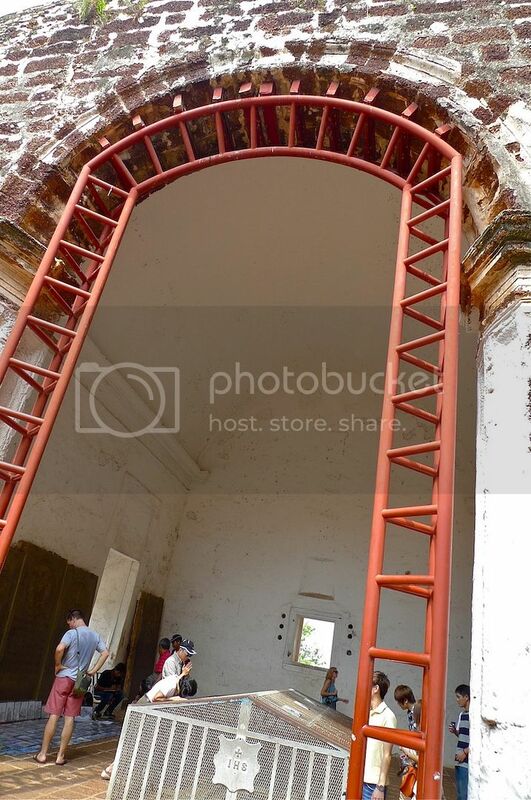 Soon we reached A Famosa. 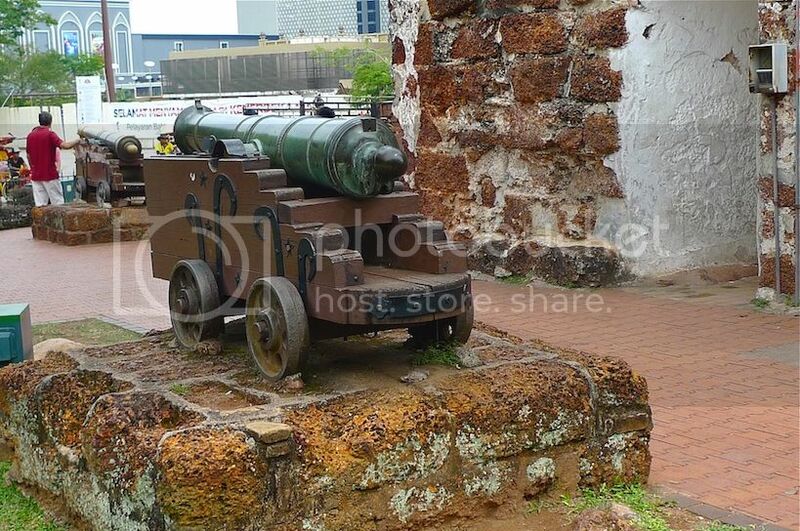 I took a picture of this cannon. 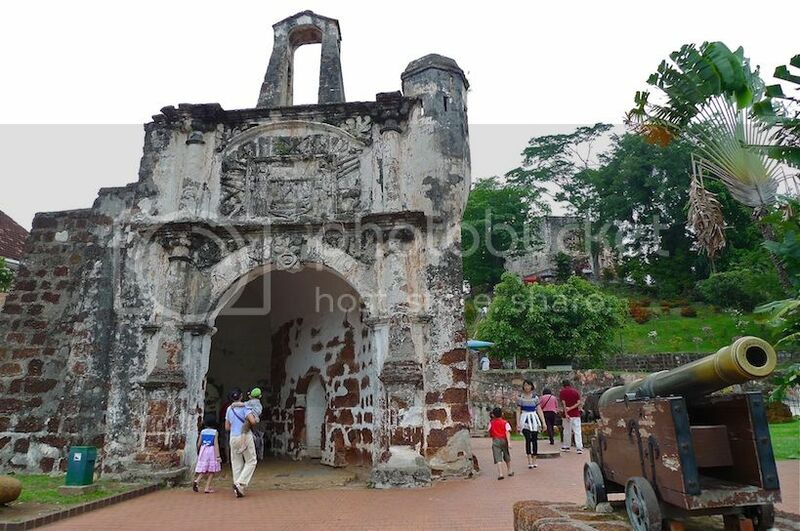 A Famosa (The Famous) is a fortress built by the Portuguese to defend themselves after capturing Melaka. It however suffered severe destruction during the Dutch invasion. The British later completely demolished it except for this small gate house called Porta de Santiago. 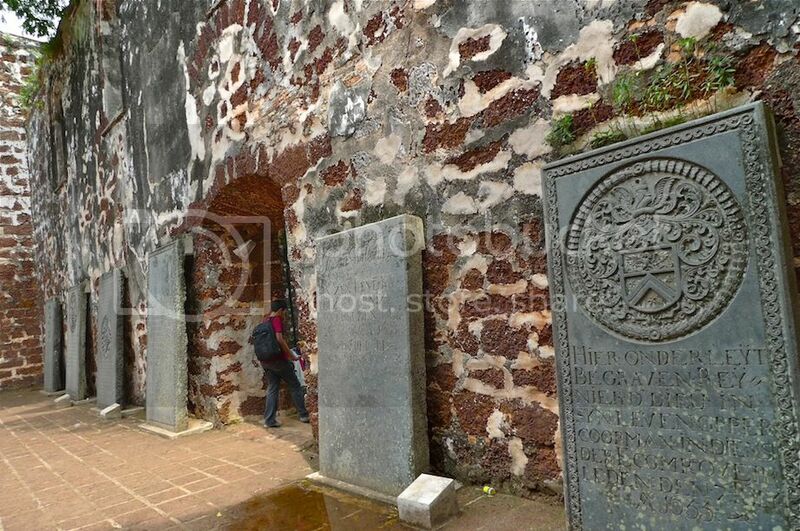 Sadly, the Porta de Santiago is the only remaining part of the whole fortress still standing to this day. Here is a photo of my Filipino friend, Joey posing in front of the fortress gate. It was a nice historical trip for us, but our stomachs were growling. So we decided to head to Jonker Street next for some food!